Submitted by Daniel Fehn on 01/07/2012 - 14:14. Similar to the muscle car, the pony car had a big impact on a generation. The exact definition of a Pony Car is a small bodied vehicle with a large engine. Some examples are the Ford Mustang, Plymouth Barracuda, Chevrolet Camaro, Pontiac Firebird, Mercury Cougar, AMC Javelin, and Dodge Challenger. The exact definitions between muscle car and pony car can be a blur, since many lump the pony cars into the muscle car group. The term muscle car is generally used more, and is a much larger group of cars. Although it is hard to argue that a Ford Mustang GT500 couldn't handle it's own in a race with a true muscle car, the majority of pony cars were a bit slower than the average muscle car. Because muscle cars have a larger frame, they could squeeze in a larger engine, giving it more horsepower. With the Ford Thunderbird going from a two seat speedster to a four seat luxury car in 1958, Ford was looking for a new model to take it's place. The new styled Thunderbird was selling well, but the dealers wanted something similar to the old Thunderbird, to bring the younger crowd into the showrooms. There was a lot of disposable income in the younger generation, and surveys done by Ford suggested these buyers were looking for something a little more sportier than the sedans currently available. Using these surveys, Ford decided to build a new vehicle named the Mustang. The rest is history, as the Mustang is still being produced today, and was one of the most successful models when it debuted, selling nearly 680,000 in it's first year. 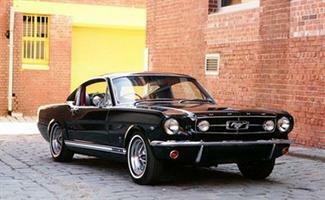 The term pony car was derived from the Mustang line, although the Mustang was not the first pony car. The first was the Plymouth Barracuda, which went on sale a full two weeks earlier, but was not nearly as successful as the Mustang. Nor does the term "fish car" have the same weight as pony car. Chevrolet thought the 1965 Corvair would do well against the Mustang, but it was quickly apparent that the restyled design didn't matter much. Chevrolet introduced the Camaro in 1967, and it was a better contender than the Corvair. It held out in it's longevity as well, going through 2002, although rumor has it that the Camaro will return in 2009. The restyled Mustang in 2005, with it's monster rise in sales, and the return of other classic muscle cars as the Dodge Charger and Challenger, have convinced Chevrolet they need to get back in the game. The pony cars suffered from the same dilemma the muscle cars ran into. A surge in insurance premiums, loss of horsepower due to new emission standards, and the 1973 OPEC Oil Embargo. The models also got heavier and bigger year by year, and eventually nearing the size of muscle cars by the early 1970's. This made the standard six and V8 engines severely under powered. The added weight of a big block V8 didn't help matters much more. Since the models suspension, brakes, and tires were designed for a compact frame, the added weight of a big block V8 stressed out these weak points. It didn't make for a very smooth ride. Buyers started moving towards larger luxury models, or smaller compact models by the early 1970's. 1974 was the last model year for the Javelin, Barracuda, and Challenger. The Camaro and Firebird were nearly cut as well, but hung on and enjoyed a long life span through 2002. The Cougar became a larger luxury model, similar to the Ford Thunderbird, and the Mustang was converted to a luxury compact model.